On a rather cold, rainy November 9, 1895, Vassar became the first women's college in the United States to hold a field day. 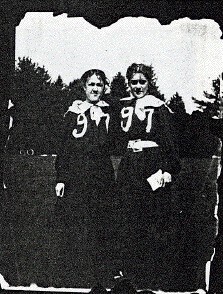 Approximately seventeen girls, supervised by the Classics professor L. J. Moore, participated in five track events: the hundred-yard dash, the running broad jump, the running high jump, and the two-hundred-and-twenty-yard dash. Events began at ten o'clock with a pistol shot in the athletic circle after the student judges took their places. For the most part, the day ran rather seamlessly, although the rain "... dripped down surely but slowly. Even the cartridges for the starter's pistol grew so damp they would not go off." Either the pistol dried out or they found another way to begin the races, as the track events ended on schedule at twelve, with a victory for the junior class. The juniors received a banner, and everyone enjoyed an elaborate meal. At two, everybody returned to the circle to watch basketball. The juniors won the afternoon with a second banner, and spent the evening celebrating. Suggested by Ida Thallon, class of '97, and organized by the newly formed Athletic Association in cooperation with Miss Harriet Ballantine, the event proved wildly popular. Despite the fact that most of the girls had not been actually trained to compete (as a spectator noted, "none of the jumpers had ever received even the most elementary instruction in how to jump,") enthusiasm ran high. The contestants wore their gym suits with sweaters: it seems that these Victorian garments constrained their performance. As one onlooker commented, "The performance in the high jump was better than it appears on paper, for, owing to the fact that the competitors wear bloomers of the most ample kind, the bar has to be cleared some four inches to allow for the sweep of these nether garments. In the future some ingenious athlete will reduce her bloomer circumference by two or three inches and the Vassar record for the high jump will be broken." A number of newspapers discussed the event with a note of condescending admiration typical of public reaction to innovations in women's sports at Vassar throughout its early years. The attention is hardly surprising; competitive sports for girls were unheard of in the nineteenth century. Although the college did not invite spectators to any of the first field days, the competitors' names and achievements found their way into the journalists' hands. In addition to reporting scores, newspapers also commented on the girls' enthusiasm, and the somewhat limited nature of their athletic abilities. They also noted with some surprise that there was only one, relatively minor accident: Miss Baker, class of '97, sprained her thumb while winning the running broad jump. In following years, President Taylor attempted to decrease the publicity by attempting to keep the date of field day secret, and due to a combination of his efforts and the effect of the day's novelty wearing off, fewer newspaper articles appeared. The first field day was so popular that the college scheduled a second one for May of 1896. In the interim, the students added a track department to the Athletic Association, responsible for overseeing and organizing field days. This extra infrastructure allowed the event to grow in both participants and kinds of competition offered. The standing broad jump, basketball and baseball throws, and the three hundred yard relay joined the five track events of the fall. Miss Ballantine also made the fence vault possible by convincing the college to add a vaulting bar to the athletic circle. Moreover, she organized at least a few training days for the students who wanted to participate, leading to a better-trained group of competitors. The newspapers commented, "There was more enthusiasm, more shouting, yelling, whistling, than at last year's events, and a general abandon of dignity that surrounds the Vassar girl." This enthusiasm ensured field day's survival for the next forty years. The perfect weather and better training probably contributed to the athletes' ability to break four of the five records set at the first meet. By 1897, the number of rules regulating field day indicates that it was already approaching the status of a regular, organized event. Miss Ballantine informed students that, "any student entering for track and field athletics must have passed a creditable physical examination by the gymnasium director; have had her heart and lungs examined by the resident physician; have a written permission from parents or guardian, and come up to a certain standard in her work." The limitations made sense: competitive athletics for women was revolutionary, so parental permission was a necessity. And, at Vassar, schoolwork always came first. All the students who wanted to participate were also required to attend training sessions. As the participants in field day appear to have been quickly evolving into Vassar's track team, this development is unsurprising. Miss Ballantine stipulated, "All competitors must practice at least three, and no more than five hours each week." The results of even this limited training soon became evident: in 1897, more records were broken. 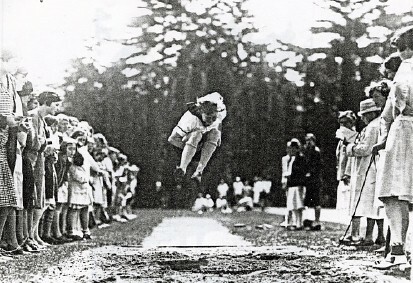 Indeed, according to one unidentified article found in a student's scrapbook, Rowena Reed broke not just the Vassar record but the women's world record at the running long jump with 13'3". By the tenth field day, held on May 7, 1904, the individual athletes' accomplishments were becoming impressive enough to warrant attention from local newspapers. An article entitled, "The Vassar Girl in Athletics," noted the increase in both number and quality of participants from the first few years of competition. However, its focus is on one particular athlete. It claims, "This year's annual field day at Vassar College... proved that man could no longer pose as the superior being on the cinder track in almost any athletic sports." The student who had apparently destroyed this particular myth, Alice H. Belding, "a freshman of the city, forever silenced those male cynics who are fond of saying that a woman cannot throw anything, by throwing a baseball 195 feet 3 inches." Apparently, this was quite a great feat: baseball was, after all, the quintessential masculine sport of the nineteenth century. Alice Belding would eventually become the head of Vassar's athletic department. The college handed out awards each year to the best athletes. One commentator noted that, "A pink V on a Vassar girl's sweater means she has broken a record," observing that the students were as proud of their V's as any student at a men's college who had won a varsity letter. The number of girls who owned such a sweater indicates how quickly the athletic abilities of the students improved over the years. Longer practice hours doubtlessly helped, but the prestige surrounding athletic accomplishment certainly was a motivating factor. With the introduction of the Shattuck Cup in 1909, awarded to the overall highest-scoring field day athlete, competition doubtlessly only grew more intense. 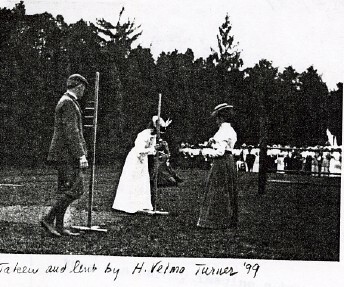 Vassar's field day traditions, like the athletic traditions at many women's colleges in the nineteenth century, became central to late nineteenth and early twentieth century discussions about the appropriate role of women in society. 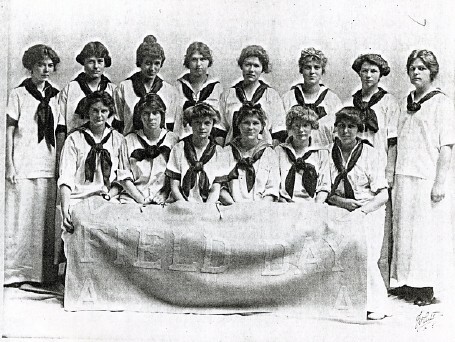 One article, entitled "Athletics for college girls" by Alice Katharine Fellows, commented on the emerging importance of women's sports in college life, symbolized by innovations like field day. It extensively discusses the implications of Vassar's field days while elaborating on the various benefits of women's athletics. Apparently (and just as Matthew Vassar had predicted when insisting on physical education as part of his original curriculum) sports make college women healthier, forcing them to balance lives that otherwise might be excessively devoted to study. Moreover, she maintains, the spirit of competition inherent to field day helps implement a fundamentally self-sacrificing instinct in the female participants. She claims that when a girl wins a track event at Vassar's field day, "in the moment of her triumph, with the excitement and enthusiasm surging about her, her first exultant thought is not, 'I've won my V,' but 'I've helped my class.' An ambition wider than one's ego - that is what a college contest helps to teach its girl participants... If athletics... can teach a girl to work for her class first and herself afterwards, it is not a small achievement." 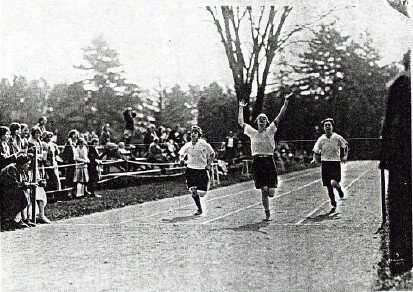 Whether or not winning track events actually inspired Vassar students to learn the feminine virtue of self-sacrifice, they remained a popular tradition for many years. Clearly, the events themselves changed somewhat. The hurdles and the seventy-five yard dash emerged rather early on. By the tenth field day, the shot put appeared, by the fifteenth, the "Hop, step, and jump," and the javelin throw by the thirtieth. As the years went by, however, neither the enthusiasm nor ability diminished; the athletes, less constrained by clothing and practice hours, continued to break the records that their predecessors had set for them. The last field day occurred in 1937. As of 1938, Vassar no longer had a track, which probably contributed to the end of the tradition. Over time, field day had slowly developed into a "sports day" with track and swimming meets, tennis, and lacrosse matches throughout the day. It seems that as other sports appeared, the track events lost the stage. Even as field day disappeared, "sports day," continued to remain an evolving tradition, eventually becoming one of the main forums for intercollegiate competition at Vassar throughout the 1940's and 50's. In 1995, Vassar held a 100 year celebration of it field day traditions with the Evalyn A. Clark Symposium on Excellence in Teaching entitled "Physical Education, Dance, and Athletics Past and Future" and with a costumed reenactment of the original field day in Noyes Circle. The college sponsored lectures about the history of athletics at Vassar College, with sporting events in the afternoon. While it is no longer an important yearly event, field day was an innovative step in women's education that Vassar should be proud to have initiated. "Athletics At Vassar." Poughkeepsie News Telegraph. 16 November 1895: 7. Daniels, Elizabeth. "Celebrating the Birth of Women's Track in America: America's First Women's Field Day." Vassar College: History of Sports Exhibition, 1995. Fallows, Alice Katharine. "Athletics for College Girls." Unknown Magazine: 58-65. "First Women's Field Day: Open Air Athletics At Vassar." Daily Eagle 11 November 1895. "Rah, 'Rah, 'Rah! Vassar, '97!" New York Recorder. November 1895. 6-7. Smith, Dorothy. "Vassar's Champion Athletic Girl." New York Herald Magazine. 18 June 1911. "Vassar Girls Win Athletic Laurels." Unknown Philadelphia Paper. 15 May 1906.